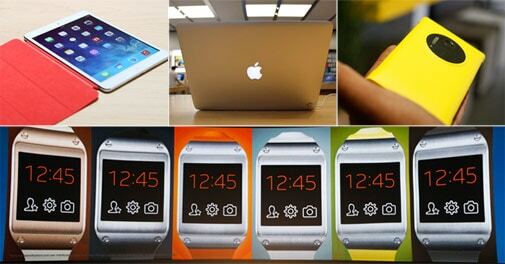 There were some great gadgets this year: Many new-and-improved ones, and a few all-new products. Have we really invented most of what there was to invent? Unlikely. But big new products have gotten fewer and far between. And in 2013, various big tech launches landed with varying thuds. Both hardware (HP's Chromebook 11, Nintendo's Wii U console, the Surface tablet) and software. BlackBerry's much-awaited BB10 operating system was launched in January, but fizzled out, crushed by unexciting, overpriced products. Windows 8, launched the previous year, flopped, and in an ever-so-unrelated move, Microsoft's Steve Ballmer announced that he would step down next year. The Air shows us what 2013 was mostly about: improvements. If Apple's new iPhones were totally underwhelming, it made up with the iPad Air. This is an overhauled iPad that looks like a big iPad Mini. It's the lightest 10-inch tablet around. It's super-thin, though at 7.5 mm it's beaten by the FTV-model-like Sony Xperia Tablet Z (6.9 mm). Sadly, the iPad Air is way overpriced, at Rs 51,900 in India for the 32 GB cellular model. And it retains its 5 MP camera, instead of moving up to the iPhone 5's 8 MP. But it's stunning (complete with Retina display), packs iWorks and other great software, and works superbly well - retaining its 8-10 hour charge despite the smaller battery. "Wearables" in the form of smartwatches were the rage in tech shows. The crowd-funded PEBBLE was first off the mark, backed by 69,000 people pledging $10 million. It sold about 100,000 smartwatches. And then Samsung launched the GALAXY GEAR. This watch runs apps, handles voice calls and text messages, and takes pictures and videos, working as a companion to a few Galaxy smartphones. That's limiting, but it's still the first smartwatch from a big brand, and Samsung quickly claimed 800,000 shipments (many were returned). It's very early days. This gear is expensive at Rs 23,000, has poor battery life, glitchy software, and very few apps. It's in many "flops of 2013" lists, but it's too early for that. Just wait for the Gear 2, expected next March, and many more. Smartphone cameras have gotten very good over the past two years. There are impressive cameras in the iPhone 5 (8 MP) and Samsung Galaxy S4 (13 MP). To prove that it isn't about megapixels, the HTC One has a great 4 MP, low-light camera. The big leap forward was the Nokia Lumia 1020. Its whopping 41 MP camera could have set off another megapixel rat race, but it isn't about the megapixels behind that Carl Zeiss lens, but how well they're used. Even with low-resolution everyday photos. Or you can take high-res photos and later crop and zoom digitally without decreasing image quality. And the 1020 now supports the uncompressed RAW digital format preferred by pro photographers. As smartphone, overall, the Lumia 1020 is far from the top. It runs Windows, which is still rather challenged on the apps front, even with Instagram and other popular apps added. But if you want a great camera with a phone, or if you're a photographer looking for a backup camera and a backup phone, this is it. Apple's 2012 Air, which I'm writing this on, was already the sexiest notebook around. What the 2013 Air did was to take this stunning device and double its battery life to 12 hours for the 13-inch model, with higher performance and a lower price. Inside it, Intel's thrifty new Haswell chip helped a lot. At about Rs 62,000, the 11-inch Air is now great value. Especially with all the free software: Pages, Numbers and Keynote, included. No Microsoft Office required. Sure, for that price you might squeeze in more specs into a Windows notebook, but that's missing the point. The Air makes a statement like no other on this side of the Rs.100,000-mark, and it works superbly (even with Windows, if you should choose to install that). It's fast, and uses solid-state storage. The MacBook Air is the benchmark other notebook vendors will still be looking to in 2014. This is the converged future: eyewear meets personal computing, Mission Impossible meets real life. You wear it like spectacles, and see a smartphone-like display in front of your eye. You can speak to it, telling it to do things. Next year, it should be integrated with regular glasses and sunglasses. It's a product from Google X, the search giant's mystery division that's worked on other future tech such as driverless cars. Glass is not a mass-manufactured product yet, but a proof of concept-now being tested among selected buyers, in its Explorer Edition ($1,500). Glass should reach store shelves some time in 2014 -- changing the wearables market forever.